XLPE Rolls & Sheets are made from closed cell cross linked polyolefin foam with excellent properties in terms of condensation control, long term thermal block and sound absorption. They come as a standard sandwich product composed of foam, alupet foil and self-adhesive backing. 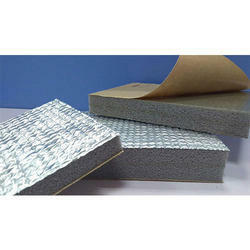 Any other combination is possible: plain foam, foam with alupet foil or foam with self-adhesive backing. The foil and the foam can have different colors (apart from the standard gray foam and silver foil) depending on the customers’ needs. The XLPE rolls & polyethylene sheets have a very good dimensional stability, showing a “memory effect” (they tend to come to their original shape after being compressed). These varied Rubber Seals are sold under the brand name of UME, Kolkata. We manufacture Rubber Seals with latest elastomeric techniques by Moulding and Extrusion methods, according to the Seal design and type, meeting all the technical values of physical and chemical properties such as Hardness, Tensile Strength, and Elongation, Compression Set, Finishing etc from Natural Rubber, Chloroprene Rubber & EPDM Rubber and as per IS 11855, 15466, ASTM, JIS and BS standards and also as per clients requirements. Liquid, Oil, Coolant, Water, Dust, Hot air, Metallic chips, Powder, Granules, Smokes etc. Marble polishing M/C manufacturing Industries. Rubber Expansion Joint/compensators have a special advantage in interrupting or muffling noise transmission in pipe line at pumps or machine in addition to their function as elastic pipe connections. They compensate for movements in pipe line, at pumps, Engines, Turbines, Machines, Equipment and Tanks and can be used to compensate for mounting inaccuracy as extension pieces on fittings or as sealing elements where pipe systems pass through walls. These are available in various different designs, with shape, fabric structures and rubber quality matched to the specific application. Made of natural / synthetic rubber like EPDM, Chloroprene, NBR, Butyl and Chlorobutyl on a strong carcass made of synthetic/cotton fabric with reinforcement of steel wire, steel ring etc. The durability of the various rubber grades depends on the type of medium being handled, its concentration, temperature, external environment, flow velocity, period of exposure and a number of other factors. Construction is of high strength fabric and elastomer reinforced with metal rings or wire. 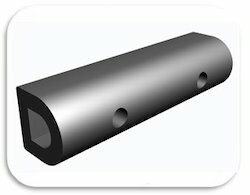 The flanges are integral with the body of the joint and drilled to conform to the bolt holes of the companion metal flanges of the pipe lines. This type of rubber faced flange is of sufficient thickness to form a tight seal against the metal flanges without the use of gaskets. Alternate design with floating solid steel flanges is also available. Rubber bellows / compensators are also designed and manufactured with plain ends to be held in place by clamps thus eliminating the need for flanges. 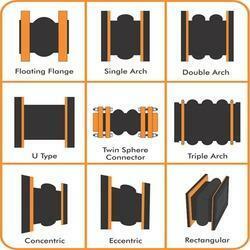 Filled in arch types can also be supplied with a soft rubber arch filler to provide a smooth interior, reduce turbulence and prevent the collection of solid material that may settle from the solution being conveyed and remain in the archway. Size from 25mm NB up to 2500 mm NB. Rectangular sizes are also available. 26 inches Hg of vacuum up to 40 Kg /cm2g. 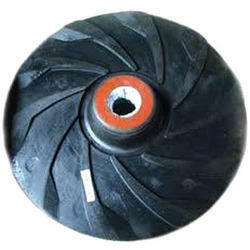 Maximum working temperature varies as per the different grades of rubber used. We manufacture Rubber Seals with latest elastomeric techniques by Molding and Extrusion methods, according to the Seal design and type, meeting all the technical values of physical and chemical properties such as Hardness, Tensile Strength, and Elongation, Compression Set, Finishing etc from Natural Rubber, Chloroprene Rubber & EPDM Rubber and as per IS 11855, 15466, ASTM and BS standards and also as per clients requirements. Universal moulders & Engineers is recognized as an industry leader and top manufacturer of precision die-cut; Gaskets, Washers, Shims, Spacers and Diaphragms. With a reputation built on Quality, and a company vision deeply rooted in serviceability and the success of our customers, Cannon Gasket has become a highly sought after supplier and strategic partner for many OEM’s today. With Custom capabilities to meet your most stringent requirements, our in house tool and die department allows us to assist with your R&D prototyping, culminating in your production orders of millions or small lots. Backed by an adept team of professionals, we are offering a wide range of Rubber Fenders. Display a high energy absorption capacity, these rubber fenders are made as per the quality norms using high quality material under the observation of our professionals. The offered rubber fenders are broadly valued for its features such as optimum quality and durability. We are offering these rubber fenders on various specifications to choose from. 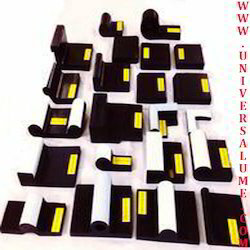 UME is most recognized manufacturer, supplier and regular exporters of various types of Rubber Oil seals in Viton, Nitrile, Neoprene, Butyl, Natural Rubber, SBR, HNBR, Alfas etc. 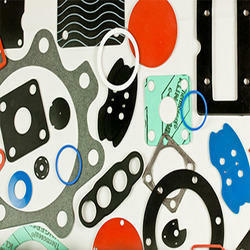 These Oil Seals are designed in compliance with set industry standards. 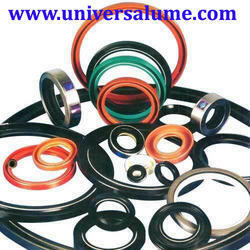 The offered oil seals are made at our hi-tech manufacturing unit using finest quality material. In addition to this, these oil seals are perfectly examined on different quality parameters for ensuring its flawlessness. 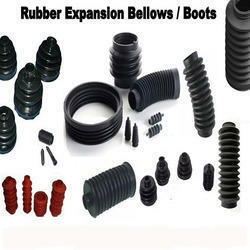 We are leading supplier and exporter of Rubber Slurry. These pumps are fabricated using high-grade material keeping in mind the exact requirements of customers. Looking for INDUSTRIAL MOULDED & EXTRUDED RUBBER PRODUCTS ?